It is still early in the holiday season but this morning investors are waking up to quite the gift as assets are rallying on positive trade news out of the G20. 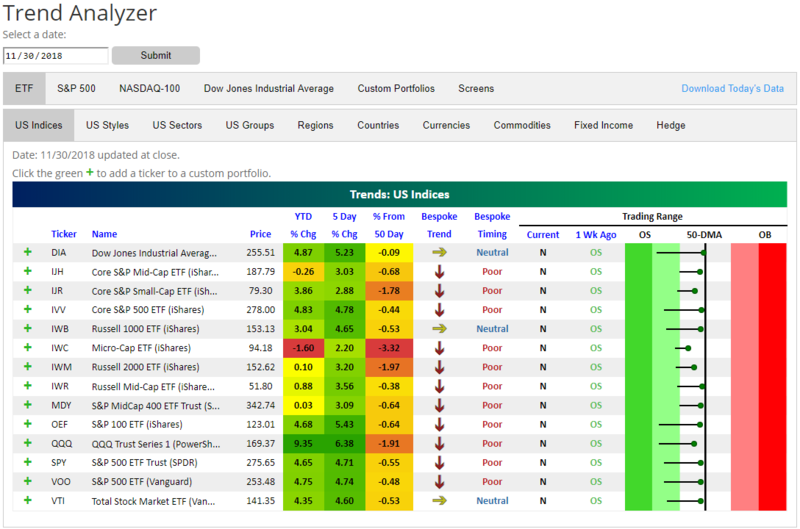 Taking a look at our Trend Analyzer, every major US index ETF ended November at neutral levels with most sitting just below their 50-day moving averages (DMA). With futures pointed sharply higher this morning, it is likely we will see a majority of these ETFs open above their 50-DMAs. Additionally, each name in this group is up from the start of last week when they were coming off of a post-Thanksgiving selloff. Things have come a long way in a week’s time. The Core S&P Mid-Cap ETF (IJH) and the Micro-Cap ETF (IWC) are the only ones with YTD losses, but even these could easily be reversed if they see the same upward movement as the broader market today.